22.7% of people experiences a panic attack onces in their lives , and between 3.7 and 4.1% of the people in the United States, and 2% in Europe have a panic disorder at least once in their lives ,,. Panic attacks and panic disorders can disturb someone’s daily functioning a lot, especially since most panic attacks (subconsciously) are related to the location/situation where it happened, for instance the supermarket. Common panic attack symptoms are pounding heart ,, dizziness , sweating (in men) , and trembling or shaking (in women) . Panic attacks can come up at once, without warning and may make you feel like escaping from the situation you are in at that moment. Although panic attacks don’t last that long, they may seem to take an eternity and can give people the feeling that they are about to die. Panic attacks are treatable and in some cases a self-help guide is enough. On this page you’ll find information about panic attacks: what is a panic attack? what are its symptoms and what is the difference between a panic attack and panic disorder? For those who do not know how to stop panic attacks themselves, we offer (online) counseling for panic attacks and panic disorders. Contact us straight away for an appointment. (Depending on your health insurance, treatment may be reimbursed). What are panic disorder causes?. Which panic disorder treatments are there? How to stop panic disorder? Online counseling for panic disorder. 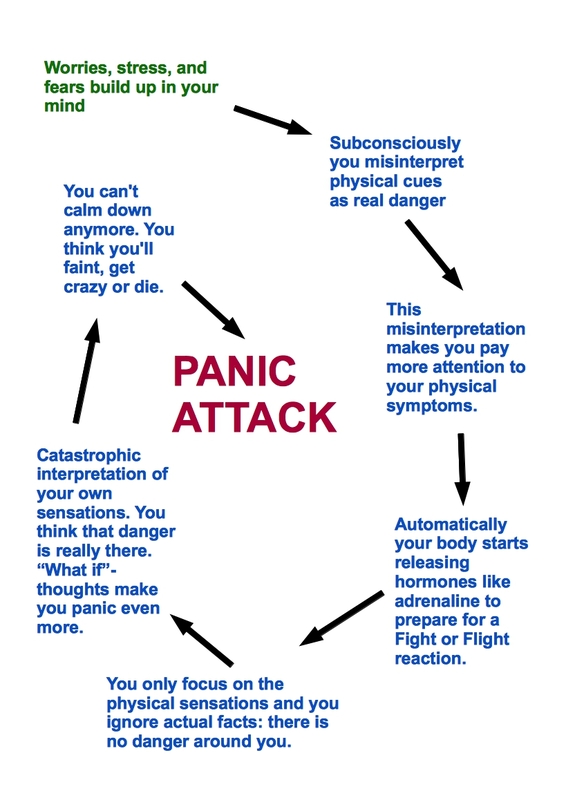 A panic attack is a sudden surge of overwhelming fear and anxiety. You may experience shortness of breath, feel your heart pounding and you might even feel like you are dying or go crazy. 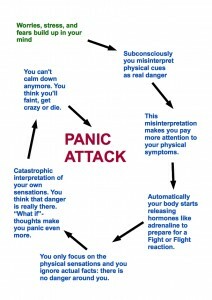 During a panic attack the fear response is out of proportion for the situation. Often the situation is not even threatening. A panic attack usually last about 10-30 minutes, but more than an hour is possible too. The problem with panic attacks is that they make you afraid for the next panic attack. You start to focus more on physical signs and misinterpret them, leading you to worry more about a possible new panic attack and eventually you will experience one. Over time you develop a constant fear of having another panic attack. This constant fear affects your daily functioning and quality of life. Fear of losing control/going insane. From panic attack to panic disorder. People can misinterpret certain physical symptoms as follows: someone experience a panic attack in the local supermarket. This person experienced a pounding heart, sweating, dizziness, hot and cold flashes, chest pain and numbness in the fingers. The next week this person needs to go to the same supermarket again. The closer this person gets to the supermarket, the faster his heart starts beating, the more he starts to sweat, and his fingers become numb. These physical sensations remind him of last weeks’ panic attack and he feels like he will have another panic attack. He returns home before reaching the supermarket. The physical sensations disappear when he walks away from the supermarket, which leads this person to think that the supermarket causes him to experience another panic attack. If you think you are having a panic disorder, please consult a psychologist or psychiatrist. The longer you wait with treatment, the more severe the panic attacks get. Agoraphobia is a condition in which the person feels anxious in unfamiliar environments, or when that person feels they have little control over the situation. Agoraphobia often becomes worse due to the fear of social embarrassment, because the person is afraid to have a panic attack in public. Triggers for the Agoraphobia anxiety are public spaces, crowds or traveling (short distances). People with panic disorder with agoraphobia often avoid a certain place (for example: the supermarket) because they experienced one or more panic attacks there. They start associating this place with the panic attacks and feel physical sensations when they get close to that place. These physical sensations reminds them of the panic attacks and the fear of having another panic attack dominates their thoughts. This becomes a vicious circle. So the easiest thing to do for these people is to avoid that supermarket… and if left untreated it will be the street or shopping mall where the supermarket is and so on. Kessler, R. C., Chiu, W. T., Jin, R., Ruscio, A. M., Shear. K., & Walters, E. E., 2006. The epidemiology of panic attacks, panic disorders, and agoraphobia in the National Comorbidity Survey Replication. Arch. Gen. Psychiaty, 63, 415-424. Lee, H. B., Hening, W. A., Allen, R. P., Kalaydjian, A. E., Earley, C. J., Eaton, W. W., & Lyketsos, C. G. (2008). Restless legs syndrome is associated with DSM-IV major depressive disorder and panic disorder in the community. The Journal of neuropsychiatry and clinical neurosciences, 20, 101-105. Craske, G. M., Kircanski, K., Phil, M. A. C., and others, 2010. Panic disorder: a review of DSM-IV panic disorder and proposals for DSM-V. Depression and anxiety, 0, 1-20. Sheikh, J. I., Leskin, G. A., & Klein, D. F. (2002). Gender differences in panic disorder: findings from the National Comorbidity Survey. American Journal of Psychiatry, 159, 55-58.